Mines are awesome fun, thumbs up from me. The knockaround from explosions is a bit extreme right now, if you send a missile volley, when the first missile impacts the other missiles will get knocked away at high speed, it’s very strange. There’s some wierd physics stuff happening and i seemed to notice a few other players teleporting when getting knocked by these explosions, seeming to cause some network problems. I like how it affects the feeling of impacts and nearby explosions so drastically but maybe toning them down a bit is warranted. Audio is another clear improvement on all fronts, it’s great. Carrier hp is invulnerable for some reason, there are swarms of immortal npc carriers on the server right now. Cruiser can still lift off in atmo, not sure if thats intended. The radar system is fancy, i just wish i had better indication on what the sounds actually meant, and the UI for it needs some sort of indication that you’re supposed to press ctrl u/y to switch targets and similar. I think missiles are too powerful right now against interceptors, this seems to be because with lower engine overcharge bonus interceptors have a much harder time evading them manually while chaff is still proving a bit inconsistent. Im not certain, but i think a chaff launched before the missile starts tracking but after the missile is launched will never have an effect on the missile, maybe the chaff duration is too low. I’m also not liking how missiles are making multiple passes even after a chaff dodge. Players who know what they’re doing will fire their missiles slightly staggered since each one is nearly a kill and so you cant use a chaff for both missiles at the same time, and this also means limited boost energy gets cut into as the staggered missiles get evaded if you’re doing it manually. Almost every time i did this today, the target could not evade even if they knew it was coming. This would be fine for lower damage missiles but seeing how strong they are if they hit an inty, i feel like the inty should be able to evade more easily. Basically if chaff works more reliably and missile turning got slowed just slightly, that might do it. It also doesn’t do any good for them to be useless either, but so far i don’t think we’ve had a patch like that. Dessie and cruiser autoguns don’t seem very threatening to light ships and don’t do much damage to corvette and up, not sure if that’s good or bad but that’s how it’s feeling right now. I think there’s a few other things i forgot after the playtest. I’ll be on again during tomorrow’s livestream and write a new post here if i remember them . All the updates seem pretty good so far. Audio changes are a big step forward. *Although I’m not so sure about the blue background, the moons and planet don’t stand out as much against it. Seems a bit cheesier. **Although maybe that’s just the HDR tripping out? ***Dropping out of warp due to shield damage in atmo makes me sad. We’re going to need to talk about the big problems with cap ships at some point. And auto blasters continuously drain power and can prevent warp until deactivated. Edit: spawning at carriers is really annoying, the are usually moving and very slow to stop (without any feedback for the player waiting). Do carriers really need to be stationary? Also with the current carrier infestation I have no idea whether my team still has capital spawn points (I suppose not but I was too lazy to check every single spawn point). When a capital is selected, stations without capital spawn points and bases shouldn’t be shown. This was done on purpose, when you’re in the middile of a large battle in an interceptor, you don’t have the spatial awareness to see / understand at all times where nearby capital ships are firing at you with their auto-turrets. So their damage is quite light, but at the same time an interceptor cannot do much damage to a capship either. I’m not sure if there’s a better solution. Increasing auto-turrets precision or capship damage = death to any nearby small ship, it would make survivability in larger battles very frustrating and you’d spend more time respawning / flying back to the battle. Short range flak weapons with close minimum and maximum ranges and a safe bubble of space close to the ship? Auto-turrets already have a relatively short range ( 4 Km ) and if they have higher damage, they become a serious nuisance to interceptors. If flak canons had high damage, but a shorter range ( ex. : 2 Km ), then an interceptor could sit in the 2-4 Km zone and never get hit. However I think Flak canons would be manually controlled by the capship player, so they could be quite fun. Auto-turrets auto-fire but do little damage and are no serious threat to a moving interceptor, but Flak canons could be a real threat to a further range if the capship owner has its attention on the interceptor. Ban Kreydis from using destroyers. I’m not sure if there’s a better solution. Increasing auto-turrets precision or capship damage = death to any nearby small ship, it would make survivability in larger battles very frustrating and you’d spend more time respawning / flying back to the battle. Outside of scouting, I’m honestly of the opinion that without some serious changes to gameplay / objective design which you already have planned for more coffin like spaces. There’s little room for an INTY in big battles. Bombers do far more then an inty ever possibly could. Perhaps we just need to change perspective and understand that a large scale battle with multiple capships saturating the filed with auto turret fire just isn’t a smart place to be. While if we have like mine tunnels / asteroid fields, that’s where an agile spaceship should be. Bombers do far more then an inty ever possibly could. Interceptors are supposed to be the dedicated anti-bomber ships though. Do you think bombers are a better than interceptors in anti-bomber role too? Outside of maneuverability the bomber has more guns to take itself out with. So I’d argue that at WORST it is equal because of that advantage. 1 missile can take out a mine. And torpedoes are 1/4th of a mine more or less for the sake of ease. So the bomber can do the anti-mine role more efficiently with 6 in slot and more missiles. It can be anti capital with it’s dmg. It’s anti small ship (But only just) Being that it’s a ‘fast’ maneuverable ship compared to capitals. … mine tunnels / asteroid fields, that’s where an agile spaceship should be. Also more large objects around space stations should help with spatial awareness as well as add more visual depth to space battles (from player’s perspective). The asteroid field should re-appear in some future patch. It might be better if strike-craft guns did no damage at all to capital ships (aside from dedicated anti-capital weapons) unless they get to point-blank range. Then you don’t need to have anti strike-craft defences that wipe people out who aren’t expecting it, and lets defending pilots know who’s attacking their side’s capitals a lot more easily. *Having strike craft go after sub-systems instead of just taking pot shots at the entire hull from a distance might be a good way to go, when subsystems get implemented. Great in general. The battles and everything feel great and didn’t I know about all the little things that still are a bit wonky and exploitable it would be a really good place already when it comes to general feel. General “fighting” is … just A class. Really good. Really fun. General match flow not so much yet. I like the changes to the AI though. Having Battles that can actually be won feels great. Bug: Destroying installations with just missiles doesn’t net any credit reward. I find Torpedo explosions a bit too wimpy … especially now with the shockwaves. I like the shockwaves and felt that he falloff was pretty alright. There are some extreme cases though where I am kind too close and the shockwave has some immense power. Blows away missiles and interceptors and such. It is fun to see and such but it feels like these harsh accelerations should break something. Other then the extreme cases being rocked around was fun … it would be cool to have some visual representation of it … I don’t mean the cliche “splosion ring” … maybe some distortion effect or particle wall or something. Probably too hard to do I guess. I liked the scouting even if I was quite bad at it … feels like there’s quite some skill to be able to be gained there. Excellent! The way it behaves and acts is also nice in my opinion. Interceptor Skin looks nice. You guys really calmed me when it came to the look of the game. Looks great. I don’t exactly know why there’s a War on the darkness of space. Now again with the grey blue background. Yes stuff is more visible but also much less visually appealing. I rather see emissive ship textures or (emmisive) lights on ships then make the background lighter so their silhouettes are easier to see. A change I do not like obviously. I like the change to station destruction to make it more varied and fun to blow up some more and other stuff. I like carpet bombing. Due to the introduction of damage of shields throwing one out of warp overriding in atmosphere is not really possible anymore. I like the tradeoff of going fast in exchange for shield energy. Sound is amazing. Doppler shift especially. Situational awareness and general cool factor increased by a lot. Sounds of ships makes it great. Corvettes closing in and such. Missile sounds. All phenomenal. Torpedo launch sound should be a lot louder in my opinion. It is a great sound but it’s too mute for the awesome nature of the torpedo. Battles (maybe Missions) need a different victory and loose sound over installations in my opinion. New locked sound is nice too. “Locking” sound not so great though. There needs to be some hysteresis there. I too often get to restart “locking” several times a second which … hurts in a way. Bug: When pressing play and opening a custom older input config file “spectator controls” are added to the file even though they already exist. The Input Mapper Version is not changed. So when correcting the error and then relaunching the whole battlescape configuration menu it does it again. Only manually raising the version of the input profile file helped to work around this. The use of a hard-coded modifier Key is quite problematic in my opinion. I have “view” not bound because I want freelook active at all times. Currently the “view” event or at least the assigned keys are used to modify two behaviours. In Capital mode Hold to Switch 3 Rotation Axis back to their normal 3 Translation axis behaviour. While Scanner active Hold to use Next/Last target to switch between selected signal. Both of them I could not use with my setup. Also, such multiple use of an event is not really helpful in making it clear. Because someone who changes his “view” control doesn’t necessarily know that it is used for more then just view. 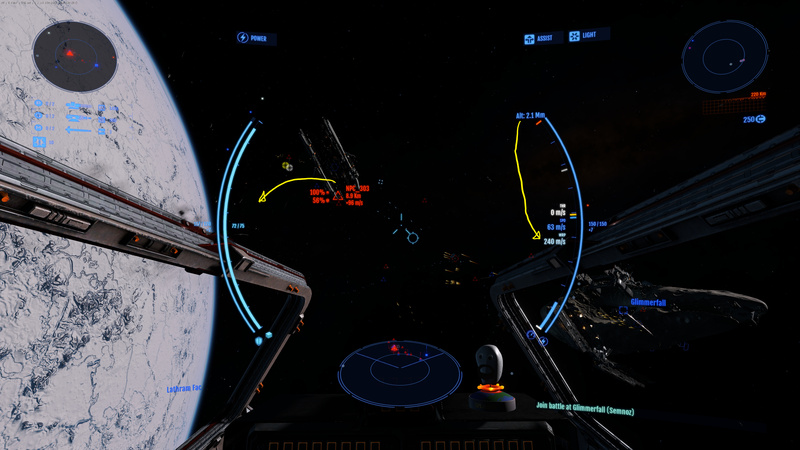 There doesn’t seem to be a way to use 6 Axis control in capital ship mode. Switchover only switches the 3 Events that Control Rotation in Capital mode back to their normal translation behaviour. The mode does not appear to use the events from any other mode. In a way I can understand the choice. An additional control mode section in the input mapper would get even more confusing then it already is and interchanging control mode controls would be even more confusing. Unifing all events would be favourable and I think Flavien is trying to make that happen. Bug: There is a bug newly introduced in this or last version where an element of a key combination of a Secondary Key does influence the function of the Primary key (or vice-versa). (Yes this is a different bug from this or maybe this bug got … worse?). It works like this. While the primary key is “active” controlling a certain action like controlling the acceleration of pitch the element of the sec key can interrupt this control. It only works again after returning the axis to zero and then bringing it back again. But if I press “keypad1” the ShipYaw dissapears and if I press “Keypad0” the ShipPitch disapears. I only pressed the keypad keys. Not the whole combination! After this I have bring back my controller to zero and restart the “turn” in order to have the game register my input again. This bug broke my setup because I used a modifier key to stop input from my mouse to shipyaw and shippitch while I was using freelook. (Because of this other bug I had to implement freelook toggle externally). Problem is due to this new bug when I use my mouse it cuts off my pitch and yaw inputs until I stop moving my mouse, return my controller to zero and restart to input with the controller. Maybe Bug: Combo Conflict Improvement does not affect “mouswheel” and “mouswheeldown”/“mouswheelup”. (have different name of course so I don’t know if it is necesary to add a special rule). This is not a request to add a special rule. Just a note. Maybe Bug: Combo Conflict Improvement does not work on the first activated key of a combo. Additionally. Every time the combo is pressed the event that is associated with the first key that is pressed in the combo is fired as well. I quite like it in general. Even though I prefer the green the setup is pretty ok in my opinion. Missile awareness is great. Nice! Maybe Distance and speed could be copied instead of moved. I am not sure about these one. That second arrow (Altitude moved down) is a suggestion to clean it up visually … don’t really know if those two other numbers (THR and WRP) are really needed … or even altitude really … but I fly FA off most of the time so I am the wrong to ask. Even though I dislike moving numbers that have to be tracked I have to say if it is on small number of priority threats and on the ring around the centre it is an alright compromise. 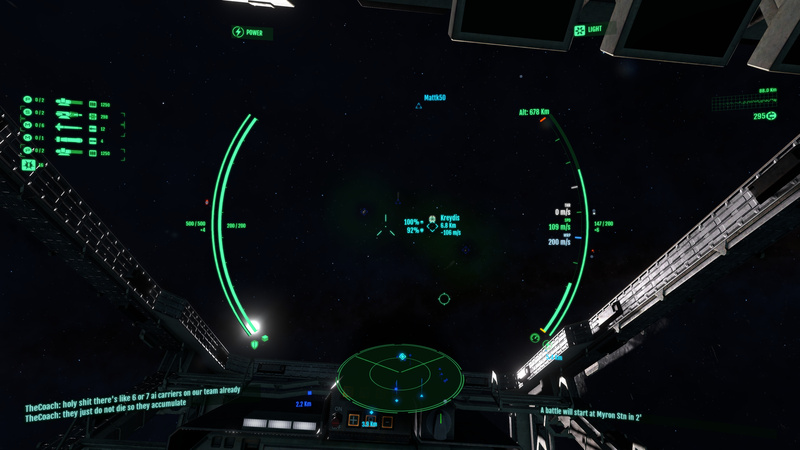 As a note the scanner seems to have different colours for the “doppler shifting” when the hud colours is changed … not sure about that though. The cluttering is still a big problem and I still look forward to something like consolidation in the future. Warp speed override is still a fixed acceleration instead of max or min acceleration. Still creating situations where releasing override will accelerate/break you faster then when holding override. Still no “AddViewDist” event. It still is Hardcoded to “DeltaTargetSpeed”. I’ll get to fix the view key being used as a modifier for capships. I do not understand the issue with the scanner prev/next, though. These keys are fully customizable, so you shouldn’t have any problem to bind them to another key(s). By the way, nice feedback Lomsor ( and everybody ). Will take some time to browse through it, sort it by priority and iterate to all the fixes/improvements, but keep them coming ! Every patch we get out, this kind of threat is immensively helpful. Thanks everybody ! Can you send me the values you used on the config file for your green color theme ? The old one was less bright and not as nice as the one in your screenshot IMO. It seems like a lot of people liked the green theme. I might just bite the bullet and add a color theme dropdown in the launcher dialog. Thanks. min warp speed popup still says 500m/s for all ships, probably a bit confusing for people. missiles still feel pretty op against inties atm. Though maybe the interceptor could use a health increase in general. Finishing off bases atm turns into a bit of a “hunt” for the undamaged pieces. Things like turrets that are already disabled are pretty annoying to find and destroy. In the end I just switched the Y with the Z value. Haha. I do think it could wait for the proper UI though. I do not understand the issue with the scanner prev/next, though. These keys are fully customizable, so you shouldn’t have any problem to bind them to another key(s). I guess I just overlooked that it is separate events. I think mines should use the ‘launch missile’ event (if you add torpedoes to the destroyer, it would be like on the bomber). We still need an indication of missile/torpedo/mine reload progress. I haven’t done much with the scanning system (I came too late to the match it seems), but apparently it doesn’t filter out already discovered stations/ships?